Your child is designed to grow, learn, play, socialize, become independent, and have fun. This is the basic business of childhood, known as normal functioning. Chronic pain can get in the way of your child's functioning. They may sleep less, have low energy and their emerging independence may stall as they go back to relying on you. Friendships can be challenged because children in pain cannot fully participate in extracurricular activities. School attendance becomes difficult due to pain and fatigue. Missing school because of chronic pain can set up a negative cycle of getting behind and then feeling anxious or stressed, which can heighten your child's perception of their pain. Other things that can affect functioning include how your child copes with pain, emotional upset (worry or sadness), and life and family stresses. Chronic pain affects parents too! Even if you don't have pain yourself, as the parent of a child who does, you'll still feel its impacts. It's common for parents of a child in pain to feel stress; experience social isolation; have financial, social or family difficulties; develop marital problems; and struggle with a sense of burden. Some parents may need treatment for significant levels of stress, anxiety or depression. It's important to realize that you're not alone. Support is available, and there are many reasons to be optimistic and hopeful. Many families have successfully progressed on the journey of a child's ongoing pain. Reach out through health networks, friends, and online communities to connect. Pain BC's Facebook group and Pain Forum on www.liveplanbe.ca , as well as the People in Pain Network are good places to start. Ongoing research continues to advance in the understanding and treatment of chronic pain. Improvements in education of all disciplines in healthcare means that there is a broader understanding of chronic pain issues. There are many books, blogs, and research articles available. New apps and websites are coming out all the time and can be used to help a child manage their pain in partnership with their healthcare team. Establish a family understanding that your child's pain is real. You can support your child by listening to them and affirming what they tell you about their pain. Help your child understand chronic pain and how to deal with it. Encourage your child to learn about their chronic pain. Some Internet resources, like this website and the others listed in our helpful resources section, are a good place to start. The more knowledge they have, they more effectively they'll be able to partner with their healthcare team to manage their pain. Be discerning about which resources your child reads as some are not appropriate for kids. Work with your child and healthcare team to find an optimal level of paced activity [link to Paced Activity topic] that does not exacerbate the pain. Paced activity is a plan to gradually increase the amount of activity your child can do. Paced activity stops the over/under exertion activity cycle and builds strength, stamina and reduce the chance of flare-ups. Help your child develop a "toolkit" of coping strategies. Find out about the different coping methods available to your child. [add link to belly breathing Live Plan Be]. Encourage your child to try them and find out which ones work best, and encourage them to use these skills regularly. Ask your child what type of support they would like from you. Each child with chronic pain is different and support needs will change as your child grows. By asking your child what support is best for them, you are showing that you care about their unique needs. Timing and type of support needs to be decided together to fit both parent and child. As much as possible, maintain normal age-appropriate expectations for your child. As children grow to teens, they want more independence and privacy. They need to set their own goals in order to be motivated. As chronic pain creeps in, it can start to take over your child's independence. Try to encourage their independence and to be more involved in their own pain management. 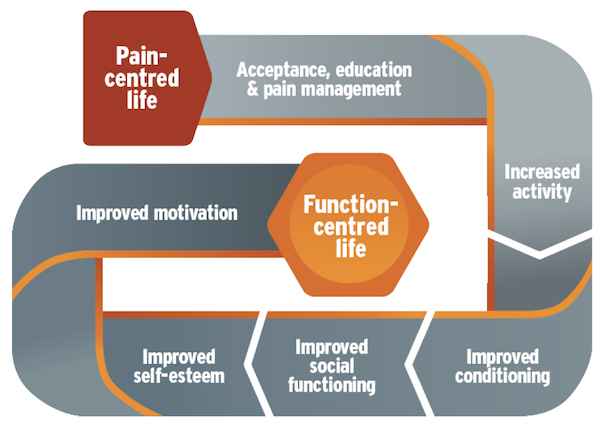 Focus on increasing function and healthy behaviours, not decreasing pain. Focusing on chronic pain draws attention to it. Children rate their pain lower when their parents distract them from it. Even on bad pain days, give attention and praise to your child when they engage in healthy behaviors (i.e., using their coping toolkit). Don't underestimate the power of distraction from pain. You can play a key role in redirecting your child's focus to positive activities. At an appropriate time in your child's management, the healthcare team will ask you to stop asking your child about pain to de-emphasise it. Since school is a child's "job," gradual return to schooling needs to be a priority. Work with school officials to decide the type and amount of schooling possible for your child. Explore academic and activity adaptations. Work with the school to develop an Individual Education Plan (IEP). Self-paced or homeschooling alternatives may be a good fit for your child if other adaptations have not been successful. Build a support network for you and your child. This can include extended family, friends, spiritual care providers, school counsellors, support groups, online communities, and your child's clinical team. Make self-care a top priority. When you're in a healthy state of mind, you'll be better equipped to help your child manage their pain. This website is designed to help your child learn about chronic pain and take steps towards managing it. Complete a Wellness Snapshot [link to assessment]. You can see all of these activities in My Pathway. Help them schedule time to learn. Praise their efforts at taking control of their health by doing the activities on this website. Use rewards as needed. 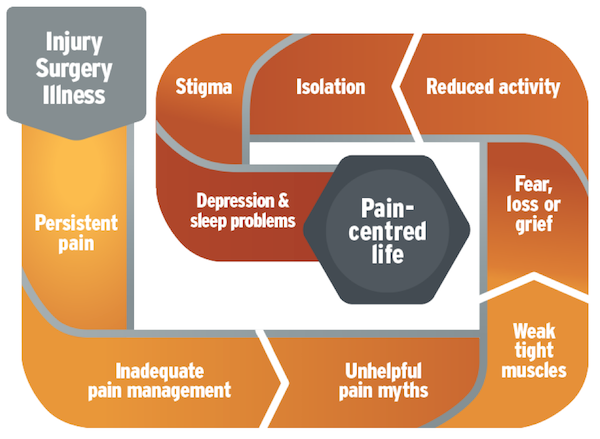 Encourage and support positive changes in health behaviours as a result of learning about chronic pain. The Plan for Health & Happiness is a tool on this site that can help your child gradually get back to growing, learning, socializing, becoming independent, and having fun again. The Plan for Health & Happiness supports your child to set SMART goals and take action around health and wellness. SMART goals are more likely to be completed as they are encourage the goal-setter to think through the specifics of what they want to achieve and how they will do it. The tips below, along with the Plan for Health & Happiness (link) will help you and your child make a plan for action. The SMART acronym describes the five qualities of good goal: Specific, Measurable, Achievable, Realistic and Timely. Help your child set SMART goals that are realistic and specific. It's good to start small. Some people like to set one goal for a few major areas of their life. Others prefer to work on one thing at a time. Either approach is fine, as long as the child feels the goals are within reach. Consider setting goals for: Schooling, movement, managing stress and emotions, having fun, sleep, etc. Let your child set their own goals. You might guide them to make their goals more realistic, but they will be far more motivated if the goal comes from them and is something they genuinely want to do. Help your child set a time frame for their goals and then regularly check in with them to see how it went. If a goal doesn't work out, help them understand why and then move on. Encourage them to think about what could be done for next time. Sometimes a goal doesn't work out, and that's OK. Help your child understand the importance of the attempt. Scale back and try again, or leave that goal for another time and set a new one. Encourage them to keep at it. Week 1 goal: Attend easiest class Monday, Wednesday and Friday. To increase the child's chance for success, set up a goal that you're confident can be gradually increased without the child experiencing setback or abandoning it. Setbacks can be frustrating and lead to a lot of upset emotions. Prepare your child for the possibility of a setback before it happens. Let them know it's OK, everyone has them and it doesn't mean failure. Make a plan together for how you might deal with a setback. It can be good opportunity to take a fresh look at what's working and what isn't, and make a new plan. Ryan has lived with pain since he was ten years old. He is now a co-leader for a youth support group in North Burnaby, part of the People in Pain Network, a non-profit support group network. He is also a valuable patient partner at BC Children's Hospital. See more about Ryan's story here. For more information on his support group, visit: The Pipain Website. Accept the situation for what it is and take steps forward. Your steps don't have to be perfect, just move forward. Self reliance is the lifeblood of chronic pain sufferers. It's your role to create a safe environment where your child can practice that skill. Depending on the personality of your child, figure out whether you need to fan the flames, or simply move out of the way. Some will need a gentle push to grow to the size their life demands them to be. Others need only to be left unobstructed to tackle the task at hand. Depending on the circumstance, drastic changes may need to be made to your child's life ,either temporarily during recovery or permanently. Switching to online courses, cutting back on commitments, implementing other ways of working (telecommuting, etc.) and even therapy or support groups can be vital not only during a recovery but in engineering a long-term lifestyle that is manageable. These are to be embraced and supported. If are resistant because you feel this is a departure from a "normal life," you're contributing to your child's already brewing opinion that no one understands what they are going through. A big part of chronic pain is sorting out how to make life work for you, and you need to encourage your child to feel that it's okay to get creative and try off-the-wall ideas. It's really important to remain optimistic and hopeful. But, being overly upbeat will make your child feel you're out of touch and not fully grasping their reality. Your child doesn't want you to fix things, they just want you to really see what they are struggling with and empathise appropriately. A large part of chronic pain management is learning how to process setbacks. They are a normal part of rehabilitation and recovery. Tell your child that your role is to help guide them through their setbacks and that setbacks mean they're learning valuable skills. Energy spent getting upset about setbacks is energy that could be spent on the next attempt to get it right. Let your child know that you expect to be told honestly how their pain levels are, and in turn you will trust that what you're hearing is true and take actions accordingly. For example, in advance come up with something nonchalant your child can say to you during social events that means they just really need to go home. Agree to achievable goals with your child in terms of sleep, school attendance, roles and rules within the family. As a parent you need to firmly hold this line. Your child will ultimately benefit in the long run. Knowing the difference between what your child says they want (i.e. to just go to bed) and what they need (i.e. maintaining a level of activity each day to prevent spiralling down further) is a very challenging process. 8. Debrief the extended family so your child doesn't have to. Some children don't like explaining their condition to extended family or friends. Remove this burden from your child and they will greatly appreciate it. There's no need to go into detail, but explain to family what they are dealing with and go through a handful of do's and don'ts. Talk with your child and encourage them to come up with what they want you to say. Children with chronic pain can range in maturity from being years ahead of their social groups and feeling like they don't belong, to years behind and having the feeling of being unable to catch up. Identify where your child falls on this spectrum and meet them there, even though it may be different to your expectations. Be prepared to re-evaluate or even completely drop strategies that have been working fine in the past because they may change quickly. Getting your child an elevator card to help manage pain when at school can be a great idea when they are truly struggling with their day to day activities. But, there will come a time where, if their symptoms have improved enough, your child would rather take the stairs and avoid the additional attention get from taking the elevator. Stay flexible: If you notice a change, ask whether your child's previously expressed feelings still match the way they feel now, and make changes if needed. Looking up symptoms online is something everyone does, and there's no harm in trying to better understand what your child is going through. But obsessive searching has a tendency to cause parents and their children to immediately start worrying on a catastrophic scale. Another issue is getting stuck in an infinite search for answers instead of focusing on skills which improve your child's return to function. Get involved with communicating your child's issues to their teachers. Set up a system to receive missed assignments over email to help them stay caught up. Dreams mutate, atrophy and intensify over time. Kids living with chronic pain tend to seek out comfort, as so much of their daily existence is spent being uncomfortable. This can create the feeling that it's better to stay within a bubble of stability than to risk further discomfort. Your child may say things like, "Why should I go to a party with my friends when I'll just pay for it tomorrow?" Help your child realize that you can always have a dream or a goal at any point in life. In my life, I've had goals ranging from "sleep less than 10 hours a day" to "work 40+ hours a week." Encourage some kind of record keeping (journal, calendar, a smartphone app, etc.) to help track progress, identify plateaus and other patterns (i.e. noticing a parallel between certain weather conditions and "bad pain days"), as this can have a drastic effect on their success. (Jerry Seinfeld's productivity method "don't break the chain" is an example.) Steer your child to refocus on how to make their life enjoyable and meaningful, not on the obstacles in their way.